The world is blind, deaf, devoid of touch and smell, and at their core, dark-hearted and desperate. They stumble where we should be stepping higher and stagger where we are called to march. Where we hear music they hear noise and where there is an aroma of wisdom and life they imagine foolishness and smell death. Their deepest sentiments are deceitful and desperately wicked and their intentions are rooted in lust and pride. Ultimately we know we live in a world where the blind are leading the blind headlong to their destruction. Even though we know this, we are tempted to follow them too. I know this sounds a bit harsh, given our current way of thinking, but I assure you it is not as extreme as what God says so clearly in His holy word. When I see this happening, and realize I am unwittingly being conformed into the image of the world instead of transformed, God brings me to the words Paul wrote the Ephesians in chapter 4 of his epistle. Hearing what it says there lovingly guides me back home to God’s reality and I remember how easily I am beguiled in my own garden. I hope it will do the same for you and you will find yourself coming out from among the world and being what God would make you. Don’t miss what you’ve just read. The world has vain imaginations, not based in reality, their ability to understand virtue, goodness and truth has been “darkened,” they are estranged from God in every way and dead in their trespasses and sins. This condition is due to the blindness of their hearts and the perversion of their desires. So why is it when they write books about how to raise children we read them with such interest? Why do we study the schemes to organize their businesses as models for our ministries? Why do we copy their music and even their marriages? I’ll tell you why. We have forgotten their obvious handicaps and stagger alongside them as though walking the way the world walks is the best we can do. Consider for a moment how absurd we have become. Imagine we live in a world filled with the blind and only a few could see. 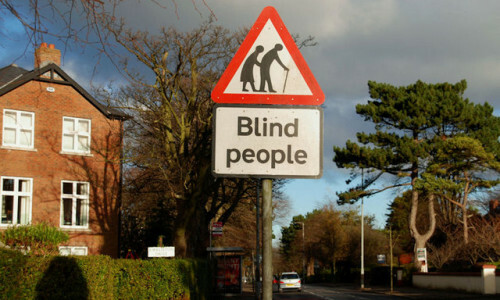 Society is built by and for the blind. The seeing are so intimidated by the majority they never advanced beyond reading braille or being led by seeing-eye dogs. It really takes little imagination, for this is our current reality. We have built our families and churches after patterns designed by and for those whose senses and desires are corrupt. For some reason, when we do this we still wonder why we’re not really much different from the world. We have allowed them to limit our creativity and dull the sharpness of our wisdom and they cannot even see the world we actually live in. This should not be. Our ways should be so very different from their ways; it should be obvious who is blind and who can see. It is our own lack of faith that has limited us. We are the children of light. Let us walk as children of light. Jesus didn’t translate us into the kingdom of light so we could remain in our blindness. We are called to be a city on a hill and a beacon of hope and understanding that should not be hid. So let your light so shine among men and glorify your Father, the Father of Lights. This entry was posted in Uncategorized on May 16, 2013 by admin.